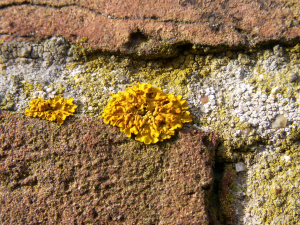 Observation - Bright Yellow lichen - UK and Ireland. Description: Found on an eastly facing brick wall. Very bright yellow. Mostly found growing off the mortar (high in sand), but some smaller on the brick. Found on an eastly facing brick wall. Mostly found growing off the mortar (high in sand), but some smaller on the brick.